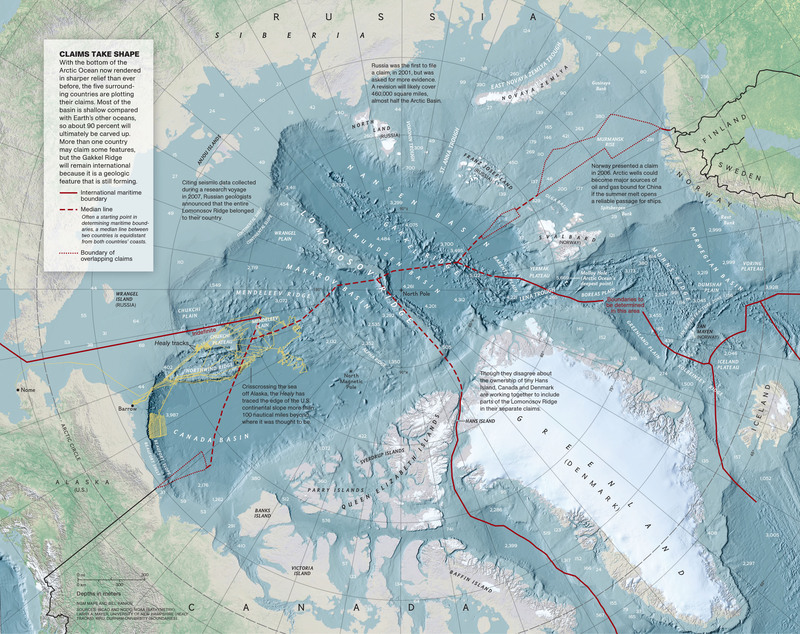 Familiarize your students with the Arctic using our activity and reference resources. Nine nations and the European Union have prohibited commercial fishing on the high seas of the Arctic Ocean for at least 16 years. The new agreement outlining the future of fishing in the Arctic ocean basin is called the “Agreement to Prevent Unregulated High Seas Fisheries in the Central Arctic Ocean.” What are high seas fisheries? “High seas” or “open ocean” refer to parts of the ocean not under the jurisdiction of any country or nation. These areas are outside any nation’s exclusive economic zone (EEZ). An EEZ extends 200 nautical miles off a country’s coastline. A fishery describes the industry of harvesting fish. Fisheries are often considered by species (cod fishery, tuna fishery) or region (North Atlantic fishery, Hawaiian fishery). What nations have negotiated the “Agreement to Prevent Unregulated High Seas Fisheries in the Central Arctic Ocean”? For some help, read through the great Nat Geo article and our own study guide explaining why the Arctic is such a polarizing region. Arctic nations. Five nations border the Arctic Circle, have EEZs in the Arctic Ocean, and have expressed at least some claims to the North Pole: Canada, Russia, Norway, the United States, and Greenland (part of the Kingdom of Denmark). What is remarkable about the new agreement? The agreement is relatively long-term—a ban on commercial fishing for 16 years. In addition, representatives will meet every two years to share information. The agreement is a tacit acknowledgment of anthropogenic (human-caused) climate change. The Arctic is not being heavily fished now, as it is largely covered in ice. This agreement recognizes a near future in which the Arctic is ice-free. Countries rarely agree to restrict economic industries. Why are these nations agreeing to entirely ban commercial fishing in the Arctic? Well, “No one currently fishes commercially in the high seas of the Arctic Ocean.” So, nothing is really going to change and these countries are not losing any economic industry. They’re just pumping the brakes on future development in that area. The agreement does not restrict commercial fishing or other extractive activities in a nation’s EEZ. Fishing, offshore drilling, and deep-sea mining within 200 miles of a country’s coast will continue to operate within the laws of each individual country. Does this historic agreement prohibit all fishing in the Arctic for 16 years?